What a difference 20 years — and $38.7 million in targeted investments — make. Cascades Park was an EPA superfund project, site of a toxic cocktail of coal tar left from the old city coal gasification plant mixed with leaked fuel from an old boat shop. Gaines Street was a “wasteland,” as City Commissioner Curtis Richardson puts it — a brownfield contaminated by old gas stations and a dry cleaner. Today, Cascades is a civic ornament. Quibbles over the aesthetic choices made by Gaines Street developers aside, the revamped thoroughfare is a major economic driver for Tallahassee and Leon County. These projects — and scores of additional street lighting, road and landscaping schemes, refreshed store facades and affordable housing — happened due to investments made by the Tallahassee and Leon County community redevelopment agency, or CRA. The agency oversees two redevelopment districts encompassing downtown Tallahassee, plus Frenchtown and the Southside. More than $15 million has gone to downtown projects and nearly $23.7 million into Southside-Frenchtown. Well documented is the fact that officials involved with the agency, including City Commissioner Scott Maddox, have been targeted by an FBI corruption investigation. Maddox declined to discuss the probe during an interview in his City Hall office. But there’s a larger question: Is the community better for the CRA’s existence? City and county elected officials insist the answer is yes. The city and county got together in 1998 to organize the CRA, and stood up the redevelopment zones during the subsequent few years. It operates under state legislation intended to help local officials fight blight and slum conditions. The agencies invest in redevelopment, then capture tax receipts resulting from any subsequent increase in property values to finance additional projects. The initial city-county negotiations grew testy at times, Leon County Commissioner Mary Ann Lindley recalled. Back then, she was the editorial page editor of the Tallahassee Democrat. “Who’s going to get cheated? How are we going to make this fair?” Lindley said, summarizing the disagreement. In the end, officials concluded that “the county stands to benefit when property values throughout the county are increased,” she said. Newcomers would be astonished by the differences between pre- and post-CRA Tallahassee. Downtown, for example, “most business had been moved out. There was Andrew’s, there were a few businesses, but a lot of the downtown buildings were empty,” Lindley said. For example, the CRA put money into a Tennessee and Monroe streets property that had been the site of a filling station. Standing there now is an office-retail building in which the Morgan & Morgan law firm maintains its Tallahassee office. “It’s a lot better than an old, abandoned gas station.” Lindley said. In all, the CRA has invested nearly $7.7 million in seven downtown projects, leveraging $168 million in private money, and realized an increase in property values of nearly $110 million through January 2016. 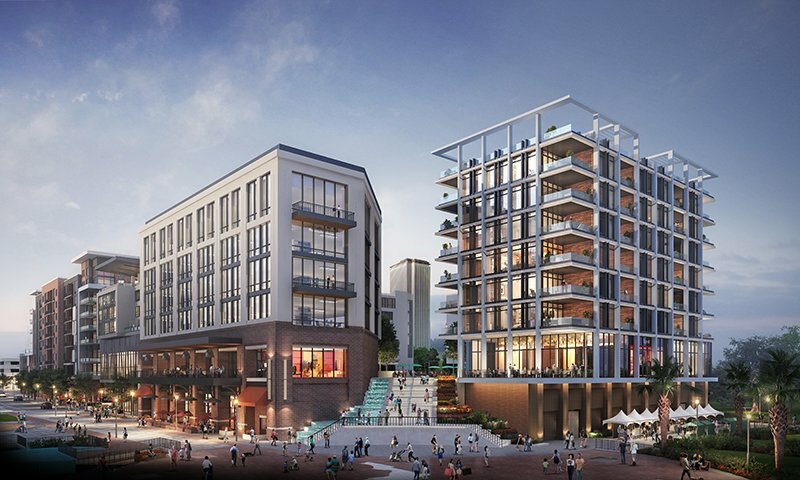 Now in the works, with CRA support, is the $100 million Washington Square project, a hotel-office-entertainment complex that will rise to 19 stories, and a $159 million mixed-use development by North American Properties going in on East Gaines Street. Large projects like these are necessary early in the life of a CRA to spin off tax takings to finance additional investments. “We are now able to reshape our programs to focus more on community and small-business incentives,” Manning said. Then there’s West Gaines Street, within the Southside zone. “Infrastructure, sidewalks, lighting, underground utilities, different kinds of landscaping amenities — all those palm trees and stuff down the middle of Gaines? That’s CRA money,” Lindley said. One of Richardson’s first acts after joining the commission in 2014 — following service on the Leon County School Board and as a legislator — was to press for expansion of the Southside zone to include more of the Bond community and South City. “It took four years to accomplish that. But eventually, partly spurred by the success we achieved with the Downtown CRA and the Gaines Street area and also by this CRA investigation, we have turned our attention almost exclusively to the Frenchtown and Southside communities,” he said. In fact, the County Commission withdrew from the downtown CRA in August — which, in any event, is scheduled to sunset in 2030. However, the county remains committed to the Southside-Frenchtown district, agreeing to extend its life for eight years. Southside projects have included business improvement grants to Proof Brewing, in Railroad Square ($50,000), and Earley’s Kitchen ($29,000) in the South Monroe-Adams corridor, among many others. In Frenchtown, the CRAs invested nearly $360,000 to redevelop the old Round Holiday Inn into the Four Points by Sheraton, and nearly $400,000 to buy a property on Martin Luther King Jr. Boulevard to house the farmer’s market, to name two examples. The agencies have plowed more than $100,000 into facade improvements in Frenchtown and Southside. These investments can pit one neighborhood against another and raise gentrification scares, according to Lindley. Then there are the purely private investments spurred by the public commitments. For example, The Standard — a luxury student apartment complex on Virginia Street — relied entirely on private money, Richardson said. He feels officials can mitigate any drift toward displacement of longtime residents. He pointed to the redevelopment of the outdated Orange Avenue Apartments, which promises to “transform the Southside of Tallahassee.” The multi-year project will see the existing structures torn down and replaced by a mixed-income, walkable neighborhood. “Not putting all low-income people together in one area, but that it will be senior-citizen housing and low-income housing, but also market rate housing,” Richardson said. Officials are working on a redevelopment plan for Bond right now. “So many of those neighborhoods don’t even have sidewalks or adequate lighting. Those are the kinds of issues we’ll be developing,” Richardson said. Maddox, who served on the City Commission from 1993 to 2003, was the city’s first elected mayor and returned to the commission in 2012, was an early supporter of the CRA but laments what he called “mission creep” — especially contributions to community festivals and other cultural projects. “I support infrastructure improvements with the CRA. I don’t support festivals, I don’t support interior renovations. I support facade grants, exterior and infrastructure, and with rare exception that’s all I’ve voted for,” Maddox said. As for the future, Maddox suggested West Tennessee Street could benefit by the same traffic-calming features installed on Gaines Street — fewer traffic lanes with a median, bike paths, angle parking, pedestrian crossing signals, store fronts directly against the sidewalk. “We could make infrastructure improvements there that would be significant. That’s a gateway into our city. It’s equidistant between the downtown area and Florida State University. There’s a lot of potential to it,” he said. It might even help resurrect the Frenchtown of old — with jazz clubs, shops and homes all within walking distance.